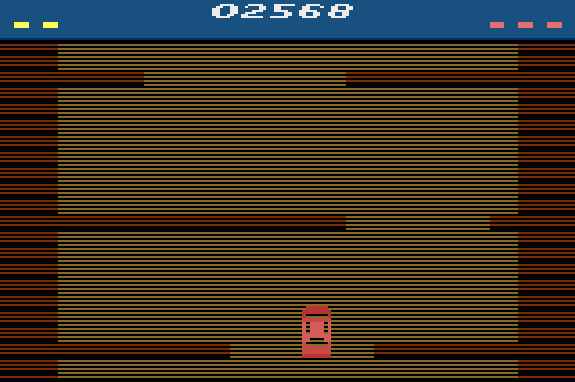 I've been developing an Atari 2600 homebrew game for the last little while, and I think it's nearing completion, but I'd like to get more feedback before I call it final. 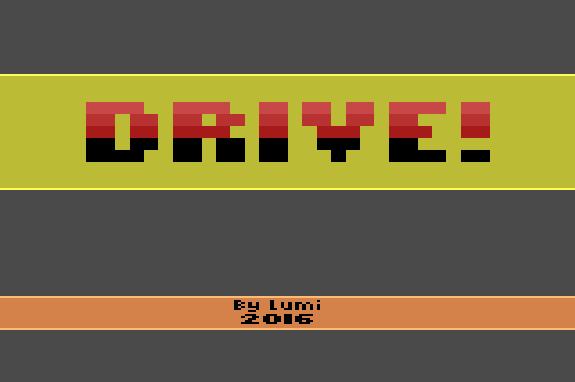 It's a 4K, single player paddle game with SaveKey/AtariVox support. In this game, you are an explorer from the year 2050. Much of the world's rainforests have been logged, leading to the discovery of a large temple constructed by ancient civilizations eons ago. You are among the first to be allowed to explore it. Suddenly, the ground begins to shake. Bricks fall from the ceiling. Maybe this wasn't such a good idea! You run outside just as the entrance caves in. As you get in your car and drive away, you realize that the bridge's supports have dislodged and it's all collapsing behind you! There's no time to think - just drive! 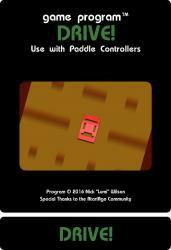 In this game, you must use the paddle controllers to steer your car left and right, avoiding obstacles in your path while collecting treasures. When you touch a treasure, you will get 1500 points and it will be added to your collection (the yellow dots on the left side of the status bar). You can have up to 5 treasures in your collection at a time. 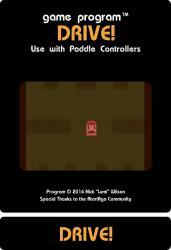 At any point, you can press the paddle controller's trigger to "burn" a treasure, giving you the energy to jump a short distance over any obstacles in your path. Any treasures you have left when your game ends will grant you an extra 1500 points. 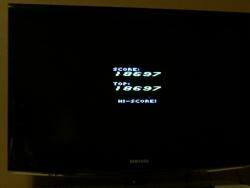 The game is won upon reaching 99,999 points. Gold coin: Does not grant any powers, is only worth points. Necklace: Gives you an extra life (the red dots on the right side of the status bar). You can have up to four lives at a time. Jar: Lets you pass through all barriers for a few seconds. Statuette: Lets you jump as much as you want with no penalties for a few seconds. The game will speed up when you get enough points. 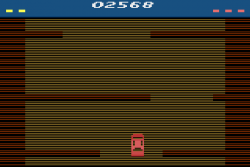 There will be a transition period where the game stops generating obstacles briefly, and the speed-up will occur while there are no obstacles on the screen. - The left difficulty switch will make obstacles farther apart (B) or closer together (A). - The right difficulty switch turns moving obstacles off (B) or on (A). If the game feels too easy for you, enable Speed Freak mode! Simply press the game select switch at any point. When the title screen's background is red, this mode is enabled. Finally, the most important feature: if you press the paddle trigger while you have no treasures in your collection, you can honk the horn! Wow! 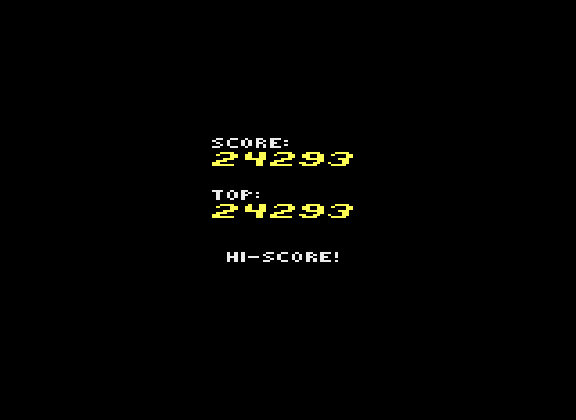 As previously mentioned, the SaveKey and AtariVox are fully compatible for saving high scores (although there are no AtariVox speech functions). It saves unique high scores for Normal and Speed Freak modes. 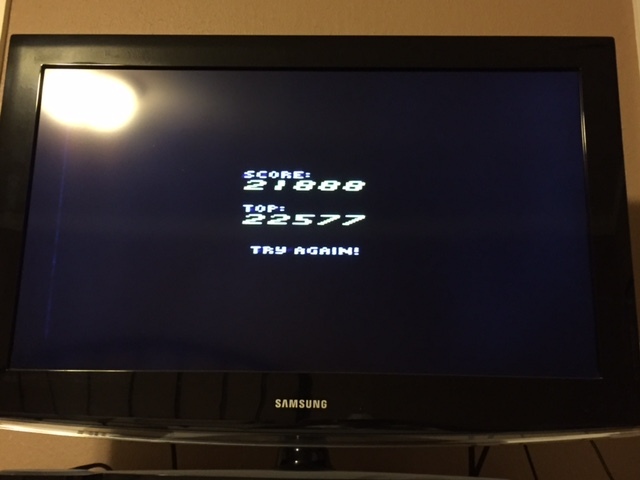 If you want to clear your high scores, press the game select and game reset switches at the same time. So, that's everything you need to know! Feel free to give feedback. However, there is very little free space in the ROM, so I probably won't be able to implement any extensive new features. Sorry about that. Edited by Lumi, Sat Jul 2, 2016 3:54 PM. An update that fixes a rare bug. Edited by Lumi, Tue Mar 8, 2016 3:21 PM. Seems very interesting! I will be trying it out very soon! it works well, no bug. Nice job ! I love the music, did you use your own music routine ? I noticed a lot of jittering though my paddles were cleaned quite recently. Did someone else noticed that too (PAL60) ? Yes, actually! I designed the music routine to play only that one song, so it's easy on RAM and ROM space, but isn't very useful if you want other songs. Edited by Lumi, Thu Mar 10, 2016 3:36 PM. I haven't ckecked how many scanlines you're firing, but just to let you know, I'm afraid this is not the right amount for pal 50, as I get artifacts on the top of the screen. Edited by Cambouis de l'Atari, Sat Mar 12, 2016 3:01 PM. According to Stella the PAL version is 312 lines, so I have no idea why there would be artifacts. I'm mainly guessing at this point because I can't test it, but try this. I may have misunderstood how PAL sets interpret the VBLANK signal. Sorry, the artifact is different, but the top of the screen is still bent to the right, I'll make you a picture later if you want. I'm sorry I can't help you more right now. Till now I never programmed a PAL 50 rom, only PAL 60 (and never a paddle handling routine). 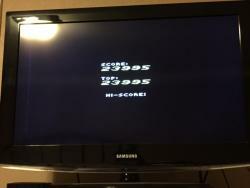 In your code, vsync is asked at scanline 276 and closed at 312, which is probably in the visible section of the screen. Your game is now perfect on a PAL console ! Edited by Cambouis de l'Atari, Sun Mar 13, 2016 11:22 AM. By the way, just a question... I'm not saying it will, but if this game were sold as a cartridge in this form, would anyone actually buy it? Edited by Lumi, Mon Mar 14, 2016 10:46 AM. Hello. 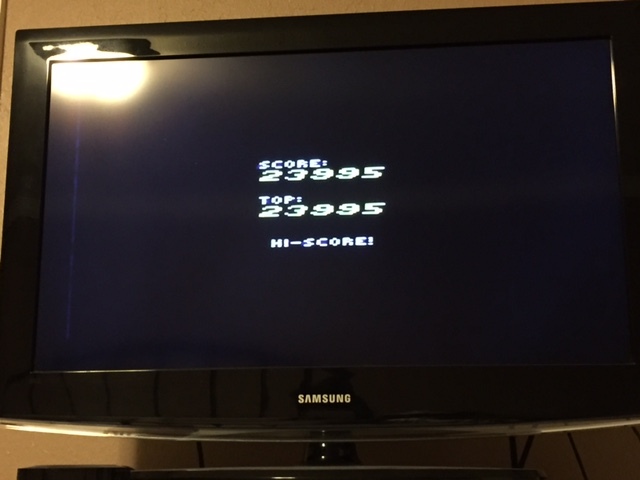 I added both NTSC versions to my Harmony cart and can't get the game to start. I see the main menu and the music plays (very nice by the way), but I can't start the game. Should it not work on the Harmony? Hmm, it should definitely work on a Harmony. 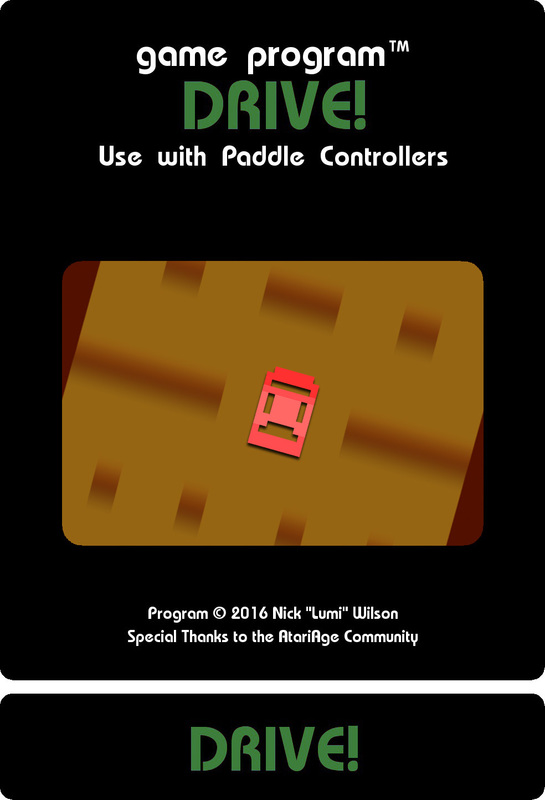 1) Are you using paddle controllers? This game is like Kaboom! or Circus Atari in that it can't be played with a joystick. 2) Are you trying to start the game with the game reset switch? That switch is used to re-boot the game. 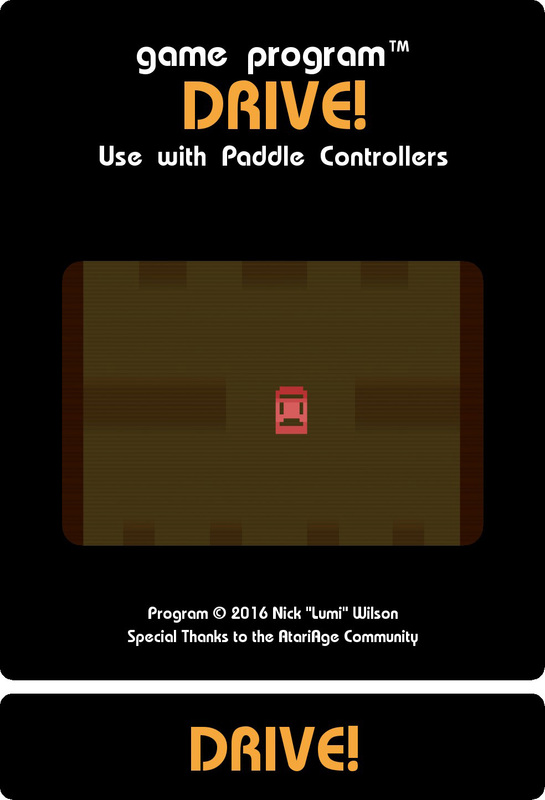 You have to use the left paddle's fire button to progress past the title screen. It also has to be plugged into the left controller port (you used to be able to plug it into either port, but it caused issues with the AtariVox features). Edited by Lumi, Mon Mar 14, 2016 10:12 PM. My apologies. I had switched to racing controllers earlier and thought I had switched back to paddles. The game works fine on the Harmony. Looks good and works well on my hardware. At first I was going to suggest adding some inertia to the steering, but then when the game speed ramped up, I decided that it was better without it. This game has me hooked. The crash sound scares me and make me jittery. 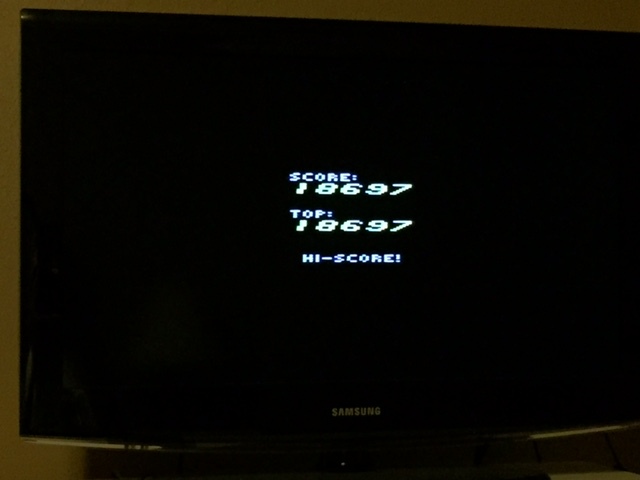 HS save is working fine via AtariVox. Definitely has that "one more try" appeal. - Thanks. Did I say, one more try? 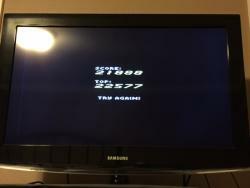 Gosh, 30,050 is hard to beat. Hats off to chavert! I'm glad you're enjoying it! Let me know if you encounter any bugs. How does this label look? looks nice, but the brown background on a black cartridge makes it a bit bland... maybe do a much larger zoom-in on the car and focus on it instead? Hmm... I see what you mean. How about this, then? I tried to make it look more dynamic. Edited by Lumi, Wed Mar 30, 2016 12:13 AM. As of version 1.4, I think I'm ready to call this game finished! I can't find any bugs to fix, the NTSC60 and PAL50 versions run at the same speed, and there isn't really any space left to add new features. Unless anyone finds serious bugs, I think I can officially call this the final version! A big thank you to everyone to helped me and offered advice and suggestions. I learned a lot, and I'm quite happy with the final product! 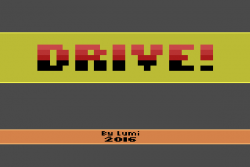 But for some reason, Drive v1.3 played thru Stella 4.0 will let me use my computer mouse as a controller (paddle) but not on v1.2 or v1.4.